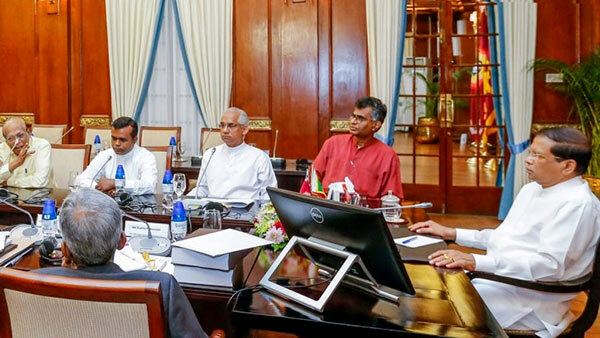 President Maithripala Sirisena held a special meeting with the party leaders at the Presidential Secretariat today (29) to discuss future steps on the report of the Presidential Commission of Inquiry into the Bond Issuance of the Central Bank. During this meeting, discussions were held regarding filing lawsuits and recovering the loss to the government. Attorney General (AG), the Governor of the Central Bank (CB) and the Director General of the Commission to Investigate Allegations of Bribery or Corruption (CIABOC) explained in detail about the progress of action taken by them against those implicated by the report. It was also revealed in the meeting that new laws and amendments to existing laws are currently being considered as per the recommendations of the commission. As such, the amendments to the CIABOC act is in its final stage, and the proposed legislation will be presented to the Cabinet within the next few weeks. The Governor of the Central Bank added that a new plan is being prepared to implement the recommendations of the Commission. In response to the claim that some pages of the bond commission report were missing, the officials emphasized that no pages were missing in the report. However some sub-documents related to the report and certain confidential parts of the document have been held back until legal action is filed. In order to ensure prompt implementation of all the recommendations of the Commission, as well as to file lawsuits against the relevant individuals and recover the losses and damages to the government, it was mentioned that,Secretary to President will hold weekly progress review meetings with relevant Heads of Units. Party leaders and representatives representing many parties including Sri Lanka Freedom Party, United People’s Freedom Alliance, United National Party, Jathika Hela Urumaya, Eelam People’s Democratic Party, Democratic People’s Liberation Front, Democratic Left Front, Ceylon Workers Congress, Communist Party of Sri Lanka were present in this meeting. the crooks will go scot free. this basically bichesitry which un like crooked financial deals is an absolute science. regardles of Allysius used sugar, molases or anyother substrate to fermnet that would yield and exact yeild of alcohol. this is then diluted to make up alloysius rum gin and whisky etc according the proof. for the toddy yields have dropped over the years. What these comediennes has to talk about.